It's a new year and we have a lot of exciting things planned. In December we quietly rolled out some really big features which you probably noticed on our update log. In this post we are going to talk about them a bit more in depth. Since starting Scribble Maps one thing that it has constantly been used for what collaboration and this was despite the collaboration having some major problems. The biggest issue is that if two people were working on the same map at the same, whoever saved last would overwrite changes by the other user. This created some serious restrictions on what you could do with Scribble Maps. For instance if a teacher wanted their entire class to work on one map, they would constantly run into problems. We had considered all types of ways to solve this problem but the problems with all the ways we reviewed were they were designed for crowd sourcing, we wanted to create something designed for organizations and smaller groups that was not tedious. The solution we arrived at was rather a simple one, it was a method coders use regularly when working together on projects and that is the idea of merging. If someone makes changes to a map while you are working on it, you will be given a prompt like this. Clicking merge will pull the most recent map, combine it with yours, and save the result. Overwrite will save only your changes and skip merging. We also added a "merge" option to the load/import menu. This will allow you to save maps with different Map Id, and merge them together. Merge works differently than import that if an overlay already exists, it will not create a duplicate. This will make combining maps much easier. This brings us to our next large feature. Up until this point user management didn't exist. A map could be associated with an account and you could let someone view/edit it by giving them a password. This created an issue, however, if you created a secure map and gave another user the password they could both edit and view it even if you really only wanted them to be able to view it and not edit it. Now when you save a map clicking "manager users" will let you add users to the map. As a free user you can add up to 3 free users and unlimited VIP users. As a VIP user you can add 5 free users and unlimited VIP users. Here is a quick breakdown of the roles. An admin can view, edit, and manage users. It should be noted that if you are the creator of the map, you will always have ultimate control and you never to need to add your self. 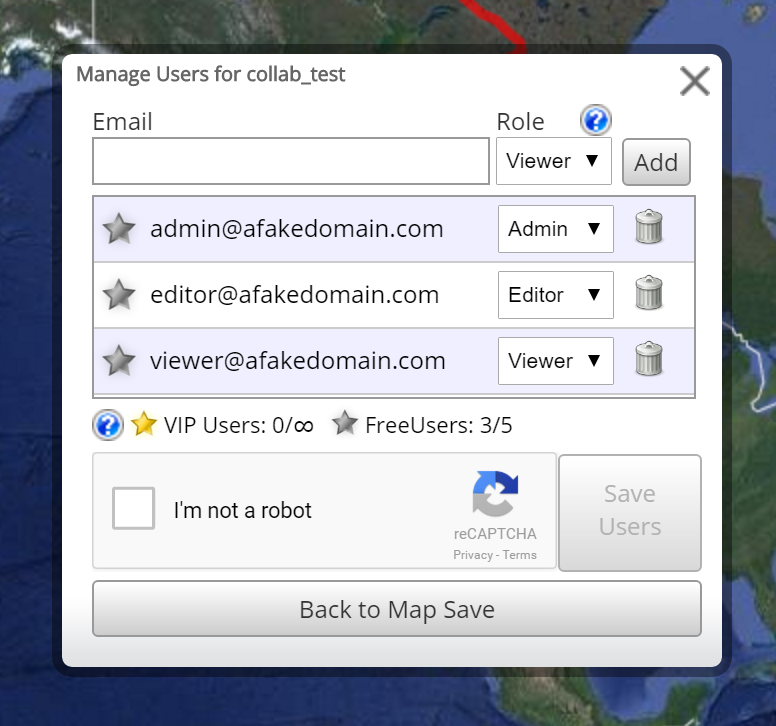 An editor can view and edit a map but does not have the ability to manage users. A viewer can view a map. This is most relevant to the "secure" map type. Normally a secure map requires a password to view. If a user is added as a viewer, they are allowed to view the secure map without a password but they must be logged into their account. Password functionality works the same, it still acts as a view and edit key. However, with the new user management you no longer need to give out a password if you only want a user to view a map and not edit it. If you have any questions about this or other functionality please do not hesitate to drop us a line using the "Get Help" button.